Contractors working on Reichert Nature Preserve among felled diseased trees. 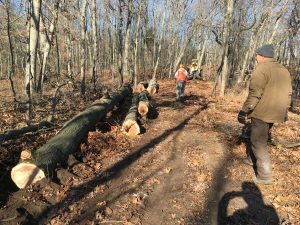 Two weeks ago timber contractors from Tri County Logging (TLC), a division of HMI Hardwoods LLC, removed 30 red and black oak trees from Legacy’s Reichert Nature Preserve as part of our ongoing effort to control oak wilt on the property. TLC agreed to take on the smaller-than-usual job to help Legacy stop the spread of the disease. The contractors will be back in March to fell another 11 trees at a second location in the preserve. Because none of the trees had been killed by the fungus their wood is not considered infectious. The timber company will use the wood for lumber and the tree tops can be used as firewood. The trees were removed because, based on the current understanding of how oak wilt spreads through a forest, there is a chance the fungus had already contacted their root systems and would claim the trees in coming years. Diseased logs harvested at Reichert. In the coming weeks, Legacy’s stewardship team will work with volunteers to remove another group of trees from a neighboring property to help prevent the disease from further impacting trees at the Reichert Preserve. Guests with permission to visit Reichert will notice the intense impacts of this work along the main hiking trail – but remember: the forest is a resilient system, and while it might be changed, it is still and will remain a functioning, evolving ecosystem. With new light from the wide open canopy we will see changes, and we will be vigilant in helping to steward with regeneration and invasive species management in mind. Oak wilt is caused by the fungus Ceratocystis fagacearum and is lethal to trees in the red oak group. Six of Michigan’s native oak species are at risk. Losing these species en masse would drastically change local natural communities. 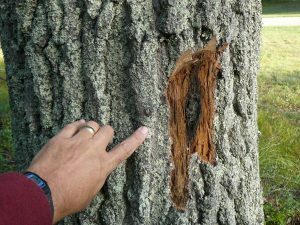 Oak wilt was identified in Wisconsin circa 1940, but the disease has become more prevalent in the past 20 years, possibly due to changes in land use and forest management. How does oak wilt impact trees? 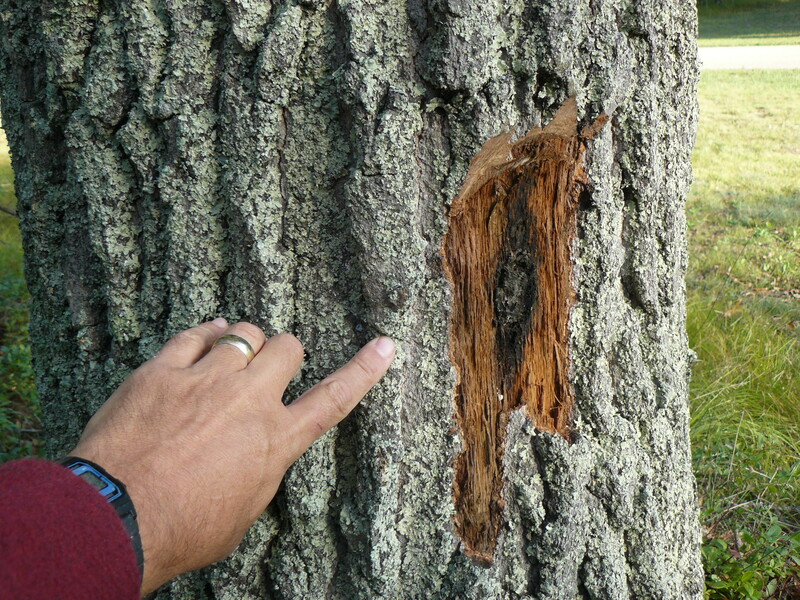 Damage to an oak’s bark can expose the tree to oak wilt fungus. Photo: Bill Cook, MSU Extension. Once infected, trees wilt and die rapidly, sometimes within weeks. The most visible symptom is leaf wilting, browning, and defoliation. Infected trees often drop leaves while they are still green. The following season, fungal mats (known as pressure pads) develop under the surface of the bark. Cracks form in the bark around the pressure pads and allow sap-feeding beetles access to the sweet, yeasty-smelling fungus beneath. These beetles deposit spores from their fungal frolic on the next oak they visit and the cycle starts anew. Once oak wilt claims one tree in an area, the disease can also spread underground through connections in the trees’ root systems called root grafts. As with other forest-management issues, prevention offers the biggest reward. Beetles that carry spores can only spread the disease to a tree that has recently been wounded. Consequently, experts recommend avoiding pruning oaks from just prior to bud opening to after leaf drop (roughly from April to October). If you must prune during the growing season, use wound paint. If you hire a professional tree service, look for one that is aware of oak wilt and doesn’t use climbing spikes. Remediation for oak wilt is costly and drastically disturbs the treated area, making prevention all the more attractive. There are many other reasons a tree might be ailing, so proper diagnosis is important. If you think a tree near you might be infected with oak wilt, please contact stewardship@legacylandconservancy.org or 734-302-5263. We’d be glad to help you find resources to diagnose the issue. For a recap of our process for managing the disease, click here.